“How I Started Hooping” Hula Hoop Giveaway! With festival season upon us, I am reminded of how I first started my hooping journey 5 years ago. I distinctly remember arriving that first year at Mountain Jam and seeing a girl carrying 10+ hula hoops over her shoulder. That was my very first introduction that weekend and I continued to be amazed at the beautiful hoopers I saw over the next 3 days. I will never forget this one girl. She was this beautiful, muscular Asian girl hooping on a cement block next to the main stage on the Mountain. She moved the hoop up and down her body so effortlessly throughout the whole set. I don’t even remember who was playing at the time because I was so mesmerized by her! From the moment I got home that weekend I was determined to find a hoop of my own and start hooping myself. I started with a crappy LED Walmart hoop and started researching hooping like crazy. That’s when I discovered Hooping.org and HoopCity and started making my own hoops! Anyway, I’m sure you are here for the contest so let’s move on! For this hula hoop giveaway I want to know how YOU first discovered hooping! Where were you? Who influenced you? 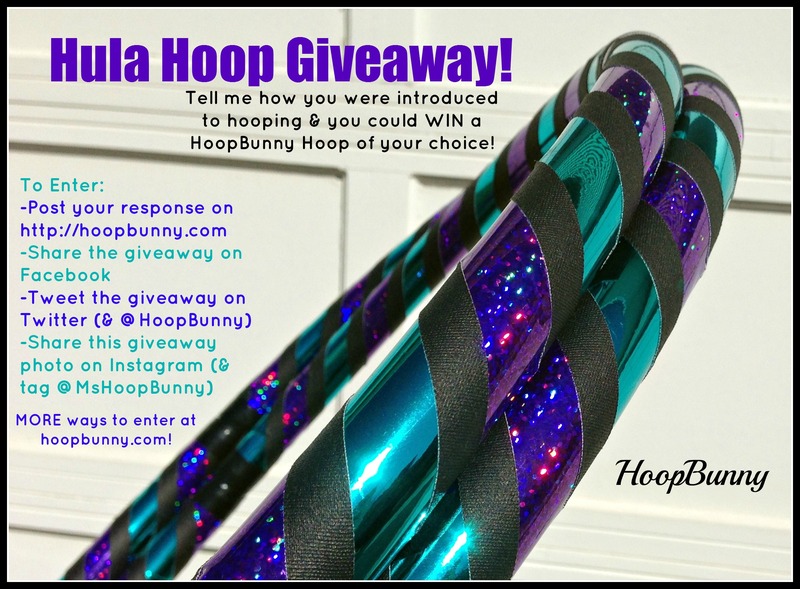 Tell me YOUR story and you could be chosen at random to receive a custom HoopBunny Hula Hoop of your choice! I will be accepting entries for the giveaway from now until 5/20/14 at 11:59 pm, there is no limit on the number of entries per person. You must be a resident of the United States in order to win this giveaway. 1. Post your response to how you started hooping in the comments below this post or on the HoopBunny Facebook page. 3. Share this giveaway on your Facebook page by posting a link to this blog post or the giveaway photo pictured above. 5. Tweet this giveaway to your followers on Twitter by providing a link to this blog post or the giveaway photo pictured above. Posted on May 12, 2014, in HoopBunny Hoops and tagged contest, discovery, Etsy, Festival, Fitness, free, Fun, giveaway, handmade, hoola hoop, Hoop, hoop bunny, hoop dance, hoop dancing, Hoop Making, Hoop Tricks, HoopBunny, HoopBunny Hoops, HoopBunny on the Web, hoopdance, hoopdancing, hoopers, Hooping, hooping blog, hoopla, Hula, Hula Hoop, hula hooping, mountain jam, mountain jam festival, mshoopbunny, selling. Bookmark the permalink. 10 Comments. I started hooping nine months ago with my now roommate Kassi. She bought me a water hoop from Walmart one day after messing around with her hoop and taught me a couple tricks. I have been hooked every since then and can’t get enough. Hooping is my escape and my way to meditate. I am so happy to found it and the community that has come with hoop dance.